Note the mileage to Serbia – our next home! Georgetown, Grand Cayman is about an hour flight from Jamaica. I had heard good things about it, so when Robert had to go there with work, I came along for the ride. If you asked what I knew about Grand Cayman’s before I arrived, I think I would have told you its a tax haven, lots of really rich people live there and there’s plenty of high end resorts on exclusive beaches. All of those things may be true to some degree, but the Georgetown that we saw was a small, modern, island community with a side of funk. Georgetown streets are modern with no potholes, usable sidewalks, modern malls and no hawkers. Drivers stopped at stop signs and waited at lights. We didn’t see anyone speed or jay walk. It was all very strange! We shopped at home stores and a supermarket called Kirks, which reminded me a lot of Whole Foods, and surprisingly the prices and quality were more American too. Why can’t I find better quality produce in Jamaica, when –just one island over– the same imported items are fresh and cost less? I understand how a wealthy island can afford the infrastructure, but I don’t understand the unnecessary squandering of quality. I think it must just be a lack of customer expectation. Needless to say, we took home a supermarket haul. We stayed at the Marriott, a resort hotel right on a very long, beautiful sandy beach. Again, no vendors to bug you, and we enjoyed miles of sand walking and looked around at the sea views. We were surprised to find that the beachfront was not covered in all-inclusive hotels. There were several other resorts, but mainly we saw residential apartment complexes. They were nice units with sea views and I’m sure they cost a pretty penny, but they weren’t fancy or over the top. The emphasis was on residential tourism — probably second homes for many. We took a drive around the island, along well maintained roads and through communities with small, attractive houses. Again, not fancy, but pleasant with a laid-back country feel. Most of all I noticed the absence of bars on the windows, and no barbed wire or security guards. I wondered if I was seeing a version of Jamaica from the 1950s? We ate out a couple of times in restaurants that were not inexpensive, but reasonably priced for the quality. Pappagallos was very nice, it even had parrots. And we enjoyed Tukka, a beach restaurant with modern, casual food and a great view, where you can sit back and hunt for shipwrecks and watch chickens at the same time. I would like to have gone back to the Caymans, but its not exactly a cheap 3-day weekend trip once you factor in airfare and car rental. I wish there was somewhere here a short drive away that made me feel like the Tukka restaurant did…laid back and safe with good quality food. Tukka restaurant on the island’s east coast. Looking out to sea at ship wrecks. This one was easy to spot but there were many more if you had the patience to scan the horizon. Tukka even supplied binoculars at every table. And we just hung out and watch the beach chickens… yes, apparently, there are lots of tasty scraps for chickens on a beach. …. Don’t they blend in perfectly?! Great colours. Hello from New York. Sometimes it hard to believe that such different cities (from the one I just called home) exist on the same planet. 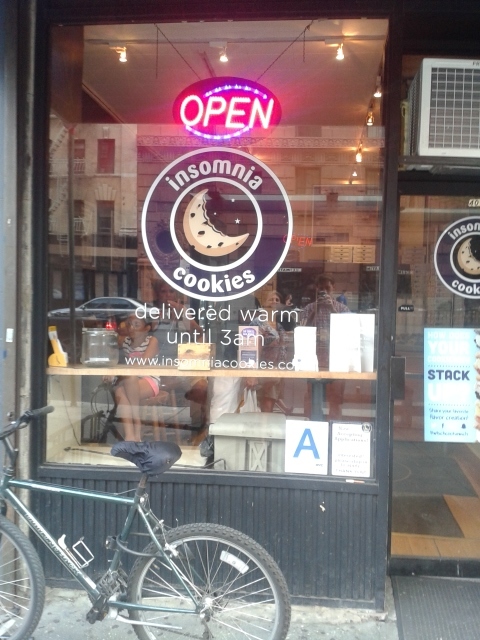 I went from a world that barely knew what a cookie was to NYC where they are available served warm and gooey for insomniacs until 3am. After five weeks of traveling, the difference is mind-bending for me, but something that you have to have experienced to necessarily appreciate…and maybe not really blogging material, at least at the level that I want to examine it. What was once normal can rapidly become normal once again, but I’m still enjoying crosswalks, sidewalks,traffic rules, fresh air and no horns. (No horn honking especially is still a pleasure!) Blogging in the midst of all this rediscovery has not been a focus or realistically possible given all the competition from travel, seeing friends and family, and just the packing and unpacking of our voluminous stuff. Last time my blog needed a little kickstart I reignited it with several short posts with the five days, five stories challenge, so I though I’d do that again starting tomorrow. This time with a Greek focus…stay tuned!